Absolut Cherrys Vodka is a popular Vodka available from Tesco Groceries in 70cl to buy online. Visit Tesco Groceries for the best price for 70cl of Absolut Cherrys Vodka or compare prices on our other Vodka products. Premium vodka, perfect for cocktails Absolut Cherrys has a rich and fresh character of sun ripen cherries. It's smooth and mellow with a long, berry and slightly sweet finish. Absolut Cherrys mixes well with a wide range of fruit juices and mixers. Try with cola and a squeeze of lime. This premium vodka was distilled from grain grown in the rich fields of southern Sweden. Unlike some other vodkas and spirits it contains no added sugar which makes it perfect for mixing. Absolut has been produced at the famous old distilleries near Ahus in accordance with more than 400 years of Swedish tradition. Vodka has been sold under the name Absolut since 1879. The Absolut distillery in Ahus is the most energy efficient distillery in the world. Where to buy Absolut Cherrys Vodka ? Absolut Cherrys Vodka Supermarkets & Stockists. 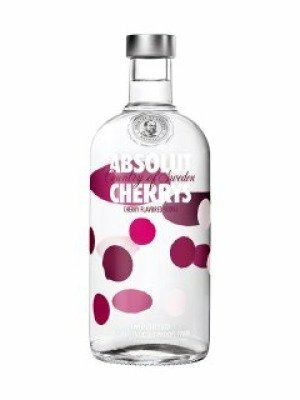 You can buy Absolut Cherrys Vodka online in most retailers and find it in the Vodka aisle in supermarkets but we found the best deals online for Absolut Cherrys Vodka in Tesco Groceries, DrinkSupermarket.com, and others. Compare the current price of Absolut Cherrys Vodka in 70cl size in the table of offers below. Simply click on the button to order Absolut Cherrys Vodka online now.